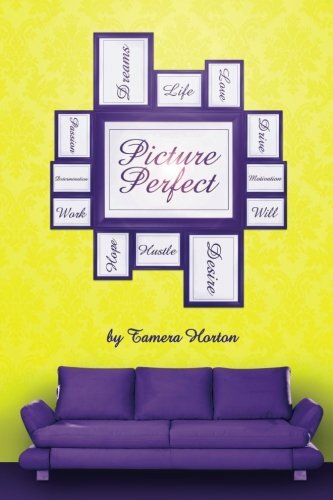 Picture Perfect is a statement about how we think life will turn out for us. Our life is viewed and judged as we go throughout the day and we hope that our spec of life is perfect. But in reality, it never will be 100% perfect. As human beings, we learn to accept and appreciate our distorted view of perfection. This collection of poems are inspired by the culmination of life experiences. They are available to help you with your journeys, new transitions, love issues, self-identity issues, and other surprises life has to offer. This book will give you reassurance that you are not on this journey alone. These words are not thoughts, they are experiences that will guide you through your own life's journey. Tamera "Tamo" Horton is a native of Mt. Morris, MI with a reputation for having a big heart. With a passion for helping others, she volunteers and donates to organizations. She's also a Big Sister at Big Brothers Big Sisters. With a Bachelors from Saginaw Valley State University and her pursuit of a Masters in Public Relations and Organizational Communication at Wayne State University, she stresses the importance of education to her Little Sister. Faced with many disappointments in her life from mental abuse and the feeling of giving up on life, she found strength to keep going. She realized that there is a plan for her life and she focused on her God-given gift, her kind heart. She has endured pain but remained persistent, keeping her peace, and pushing toward greatness. As an author, the purpose of her words are to encourage others to persevere and empower readers to recognize their worth and never settle for anything less than the best.